The U.S.-U.A.E. Business Council hosted an exclusive dinner with U.S. 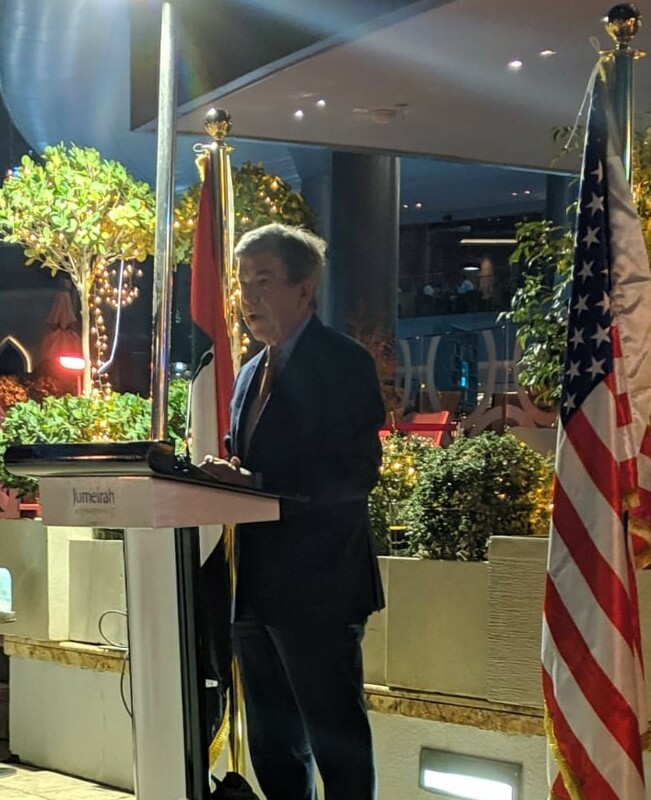 Senator Roy Blunt in honor of the Special Olympics World Games Abu Dhabi 2019, the first World Games to be held in the Middle East North Africa region. 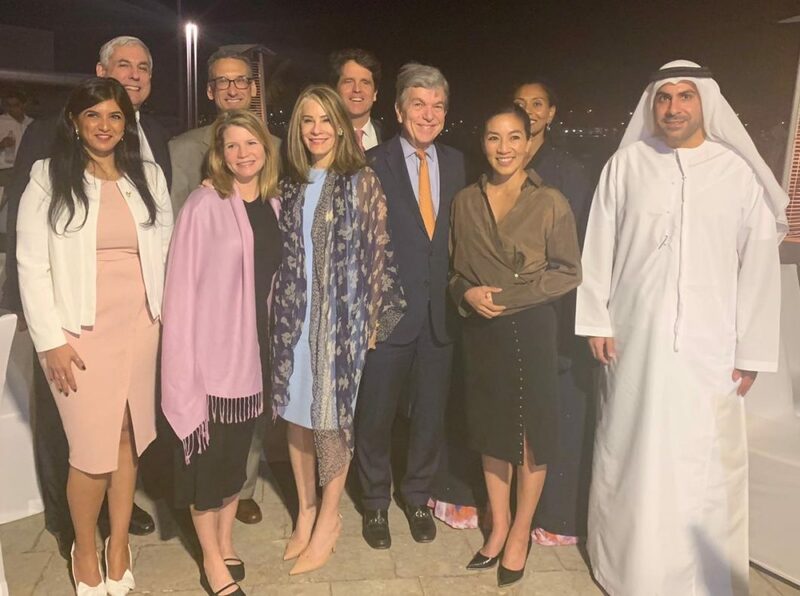 Over 50 senior executives from leading American and Emirati companies gathered at Jumeirah Etihad Towers in Abu Dhabi to honor the athletes competing in the Special Olympics World Games and welcome Senator Blunt to Abu Dhabi. Other special guests included former U.S. Olympian and Special Olympics International Board Member Michelle Kwan as well as Special Olympics International Board Member Mark Shriver. After honoring Senator Blunt and other distinguished guests for their presence, U.S.-U.A.E. Business Council President Danny Sebright said “the Special Olympics World Games being held in the U.A.E.’s capital highlights the country’s commitment to the inclusion of people with disabilities. Tonight we honor the many great achievements of Special Olympics athletes and the U.A.E.’s status as a welcoming and inclusive country for all people”. He hailed the U.A.E.’s commitment in this regard as it puts special emphasis on the Year of Tolerance and he invited all guests to Meet the Determined at the World Games at some point during the week. The dinner also provided the opportunity for attendees to discuss with Missouri’s Senior Senator the U.A.E.’s business environment and the strong commercial ties between the U.S. and the U.A.E. as the U.A.E. has been the largest U.S. export destination in the MENA region for the past ten years. U.S. Chargé d’Affaires Steve Bondy also provided welcome remarks and highlighted the recently released trade figures underscoring the importance of the bilateral trade and investment relationship. Chargé Bondy commended the U.A.E.’s commitment to inclusion in hosting the Special Olympics World Games and said that taking part in the games was truly life-changing. Senator Blunt stated “we had a good discussion about how we can further strengthen the U.S.-U.A.E. economic partnership, which is one of the fastest growing U.S. economic partnerships in the world. As a longtime supporter of Special Olympics, I appreciate all the U.A.E. has done to make these World Games a wonderful and memorable experience for all of the athletes, coaches, families, and fans.” Senator Blunt said that he was also especially proud of efforts to promote the Healthy Athlete program and discussed the manner in which this program makes a difference around the world. In his closing remarks, Mr. Sebright thanked Senator Blunt for his support of the U.S.-U.A.E. bilateral relationship, the Special Olympics World Games Abu Dhabi, and wished American and Emirati athletes good luck. Please see below for more information about the Special Olympics World Games and for a biography of Senator Blunt. The World Games, held under the patronage of His Highness Sheikh Mohammed bin Zayed Al Nahyan from 14-21 March, is the single largest humanitarian and sporting event in the world in 2019. More than 7,500 athletes representing over 190 countries are competing in 24 summer sports in Abu Dhabi and Dubai. The athletes are joined by 2,500 coaches, 20,000 volunteers, and an anticipated 500,000 spectators. The U.S. delegation comprises over 200 athletes, competing in 18 different sports, as well as 60 coaches, and 34 delegation members supporting team operations. This global event will garner 120 hours of live television coverage and the closing ceremony will be broadcast to 170 countries around the world. Building on a background as a public servant, university president, and teacher, Roy Blunt was elected to the United States Senate in 2010. Senator Blunt serves as the Chairman of the Senate Republican Policy Committee and as the Chairman of the Senate Rules Committee. He also serves on the Senate Appropriations Committee; the Senate Commerce, Science and Transportation Committee; the Senate Select Committee on Intelligence; and the Senate Rules Committee. He is also the Chairman of the Appropriations Subcommittee on Labor, Health and Human Services, and Education. The people of Southwest Missouri overwhelmingly elected Senator Blunt seven times to the U.S. House of Representatives. Senator Blunt was elected the Majority Whip earlier in his career than any Member of Congress in eight decades and was elected to the Senate leadership in his first year in the Senate. Before serving in Congress, he was a history teacher, a county official, and in 1984 became the first Republican elected as Missouri’s Secretary of State in more than 50 years. Senator Blunt also served four years as the president of Southwest Baptist University in Bolivar, Missouri. Senator Blunt is married to Abigail Blunt and has four children and six grandchildren.